The world’s largest phone maker Nokia, is also in trouble. Much like Motorola that recently announced some lay offs and reorganization, Finland based Nokia will also be implementing some changes in their company that will streamline production, increase sales and basically keep the company afloat. As all streamlining goes, jobs will be lost. 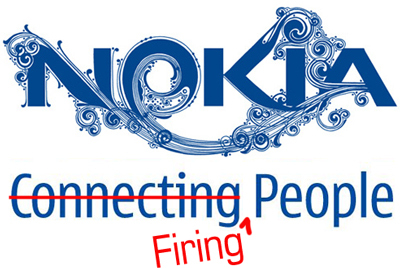 Nokia will be laying off about 600 of its workers, some 200 in Finland, others elsewhere. Of course the reason again for the move is the financial crisis that’s crossed the pond from Wall Street into the European markets. Businesses all over are in recession as consumers aren’t spending as much. Nokia even plans to beef up its low end phone marketing and production to curb the effects of the economic turmoil. "Today’s changes are part of Nokia’s constant renewal where it is important to be close to our customers and ensure that our people are able to focus on the key business priorities. Also, our aim is to find alternative work within Nokia for as many employees as possible," said Juha Äkräs, Senior Vice President, Human Resources, Nokia. In addition, Nokia plans to close its Turku site in Finland and relocate those activities predominantly to Salo (Finland). Nokia currently has 220 employees working in the Turku office and the aim is that the employees would continue in Nokia’s site at Salo or in the capital area in Finland.